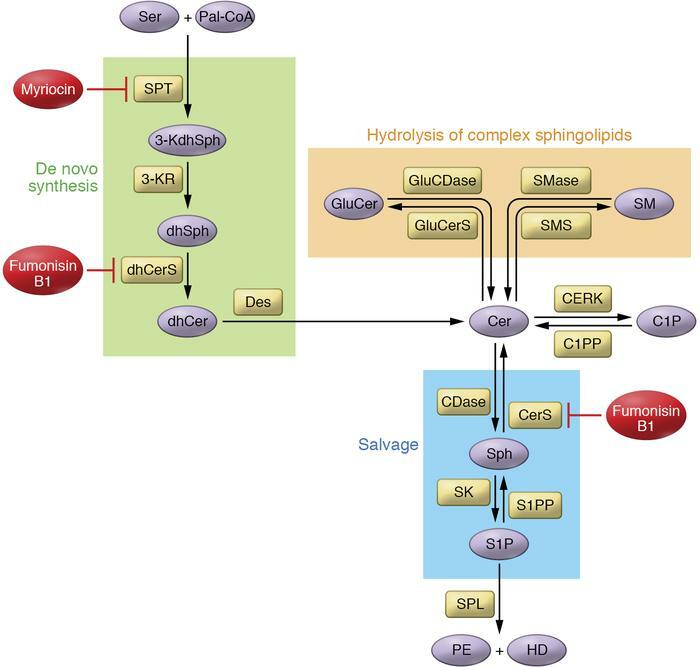 Cer plays a central role in the complex network of sphingolipid metabolism and can be synthesized by many different enzymes belonging to different pathways. Cer is also one of the most potent bioactive sphingolipids. It can regulate cell biology by inducing cell cycle arrest and senescence. Its role in cell death has been extensively investigated. The few direct targets of Cer that have been discovered are mostly protein phosphatases. By activating them, Cer can modulate signaling pathways. Another very well-studied sphingolipid is S1P, which has been shown to induce cell proliferation and migration among other functions. Its actions are mostly known through its ability to activate GPCRs, leading to modifications of cell biology. Two pharmacological inhibitors have been extensively used to study sphingolipid metabolism: myriocin inhibits sphingolipid synthesis through the inhibition of SPT, and fumonisin B1 is a CerS inhibitor, inhibiting de novo and salvage pathways. Des, dihydroceramide desaturase; dhCerS, dihydroceramide synthase; GluCDase, glucosylceramidase; GluCerS, glucosylceramide synthase; HD, hexadecenal; 3-KdhSph, 3-ketosphingosine; 3-KR, 3-ketoreductase; Pal-CoA, palmitoyl-CoA; PE, phosphoethanolamine; S1PP, S1P phosphatase.